What type of seats are available on the board? Your whole year will be just like its first day! – states the Hungarian proverb. In this spirit, make sure, that your new year will be full of comfort, luxury and joyful, quality pastime. Bid farewell to the past year and welcome the new one with an outstanding celebration! On New Year’s Eve, we invite you to our luxurious catamaran to a truly special cruise. Travel in time with us as we set sail in 2019 and anchor only when it is already 2020. Cruise on the waves of River Danube between the magical, floodlit riversides of Buda and Pest. Celebrate New Year’s Eve with family, friends or colleagues, our special dinner cruise is a perfect choice for all of you. New Year’s Eve is a special occasion for everyone. If you would like to spend it in exclusive, luxurious environment, join us on our outstanding dinner cruise! 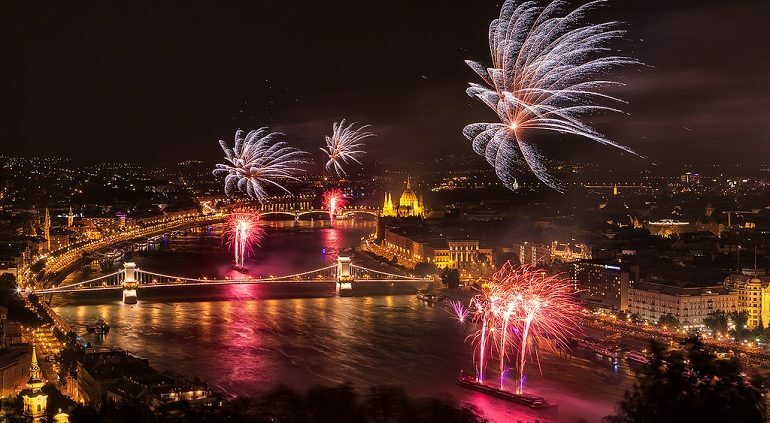 Exquisite Budapest New Year’s Eve Dinner, magical, golden panorama and a festive piano show guarantee the captivating, joyful atmosphere of this special night. Welcome the New Year at midnight! As we set sail, we greet our dear guests with a welcome drink, and then, as we serve a festive, four-course dinner, an enchanting piano show ensures the celebratory atmosphere of the cruise the whole night. This 4-course dinner offers you plenty of choices to select the ideal dinner for you. Even you prefer international or Hungarian taste you will find the best options. Are you vegetarian or Vegan? No problem, the variety of dishes allows you to find your type even if you have a food intolerance. Just choose the little Burchée for the starter for example, then a vegetarian potato cream soup to leave enough place for the main course of our popular dinner. Select one of the six options we offer for the main course, but don't forget the best part, the point when the dessert arrives and dulcifies the evening atmosphere even more than it has been before. Our main goal is, that everyone may find the most suitable dish for his/her personal taste. After the exquisite dinner, we anchor in front of the floodlit House of Parliament until it clocks midnight, and we toast together for an already fantastic New Year. And the after-midnight snack is going to follow one of the plenty of Hungarian traditions to have good luck, health, wealth and of course happiness for the next year. Since Hungarian people are very superstitious, lentil soup will be served, as lentil looks like little coins and based on the tradition, as much as lentil you can eat, as wealthy you going to become. By the way, Hungarian people believe it is forbidden to start the new year with eating poultry since hens scratch the ground backward and this takes luck aways. against this pork brings future, because they root up the luck forward. This is the reason why stuffed cabbage is the main course at midnight, like the traditional pork food bringing luck for the new year. 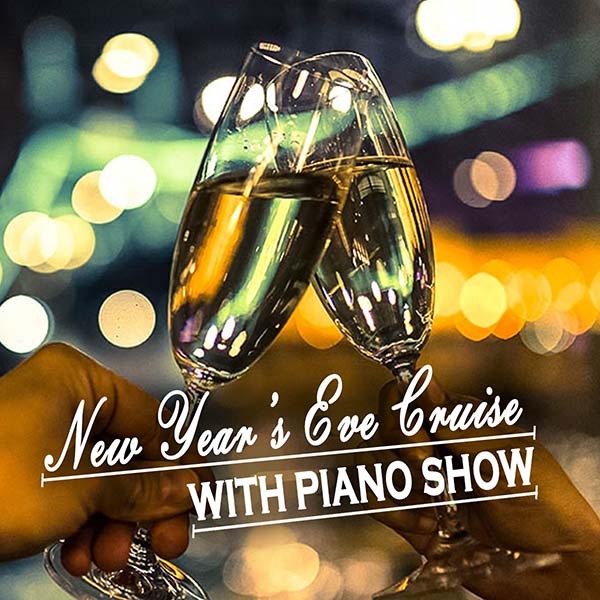 Our Budapest New Year’s Eve dinner cruise with the amazing piano show guarantees an unforgettable experience for our guests. We cruise through Budapest on the most breath-taking and romantic river section, the bridge-woven, floodlit Danube. While you and your loved ones spoil your taste buds with a phenomenal dinner as you marvel in the magical panorama, our talented pianists’ show ensures the special atmosphere of the night. Our drink package includes unlimited wine and beer, mineral water, and fizzy drinks and hot drink consumption during the whole night. If you don't claim this unlimited drink package you still can choose plenty of drinks from our drink menu including cocktails, different type of wine, champagne etc. In this case, you just pay what you have consumed. You can purchase this drink package now, together with your ticket or on board upon arrival as well. Can you imagine a better way to welcome the new year? The price of our New Year’s Eve cruise includes a welcome drink, a four-course dinner, champagne and an up to par musical experience. In order for the highest comfort possible, tickets for this special occasion are available in limited quantity! 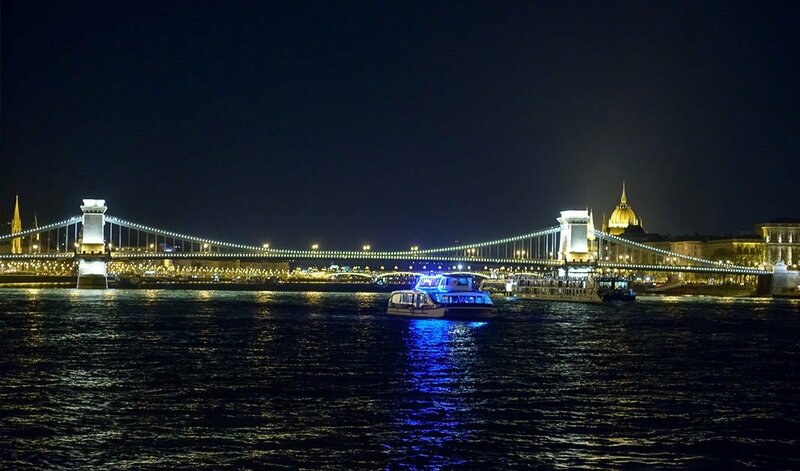 Buy your tickets for our Budapest New Year’s Eve Dinner Cruise and surprise your loved ones with a truly special and exclusive experience! Celebrating New Year’s Eve abroad offers a lot of advantages because you can learn a lot about the visited country, but at the same time you learn a lot about their culture by trying all the NYE traditions and this turns you from an average tourist to an experienced and adventurous traveler. Sounds better, right? Join us at NYE on board and experience a new way of welcoming the upcoming future. 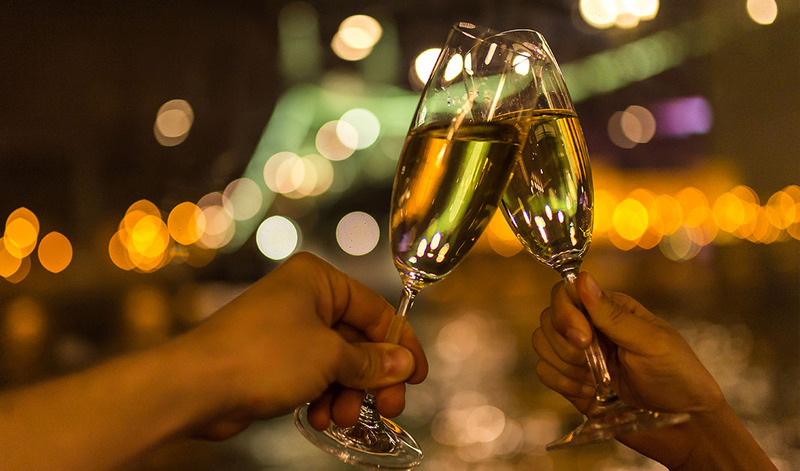 Be greeted by a complimentary drink upon arrival and just relax during the whole evening, we will do our best to make sure you get a great, unforgettable evening in Budapest. Bring your memories with you as you get to experience the Hungarian Szilveszter traditions while you spend your holiday in Hungary. What is szilveszter? This is how we call New Year’s Eve since Hungarian people celebrate name’s day and the day of 31th of December belongs to the name Szilveszter. Basically, we all celebrate the name days of all the living Szilveszters. Would you like to join us?